More and more arrests occurs in the streets -workplace or at home daily in Iran . For now regime is busy targeting the journalists, bloggers and those with social media connections to silence them. This is happening because of regime's fear for their important role in the coming 11th presidential election on June 12,2013. News from Iran indicate that; officials are more and more talking on their power ability to control the situation and usually in this kind of situation more public hanging take place to scare people and increase in national holidays aims to decrease big city's from its population.Regime does all these tactics to continue to stay in power a bit longer. The Iranian society talk about the coming birth of a new situation and when this will take place no one knows . It seems not only the Iranian people but also the world expect soon the peoples power will shake this regime. Reyhaneh Tabatabaei a journalist for reformists newspaper is arrested today ( Thursday Jan.31,2013) in Tehran.In the past Ms. Tabatabaei was arrested and spent 40 days in " Band Do-Alef Sepah" (solitary confinement) in Evin prison. Reyhaneh Tabatabaei is journalist of Sharq Newspaper .She also worked in other newspaper as well. In another news Mrs.Fatemeh Sagharchi editor of "Jamaran" website is also arrested on last Saturday at 8:00pm in her home. She was former manger of the "Center for Strategic investigation " library. But Motahareh Shafie, one of the ten arrested on “Black Sunday” (27 January), was released yesterday, so the number currently in detention now stands at 13. Other journalists in Tehran and various provinces have received summonses and are awaiting interrogation. The two arrested yesterday were Kivan Mehregan, who writes for various reformist newspapers, and Hossein Yaghchi, who works for the weekly Aseman and the monthly Tajrobeh. According to the information obtained by Reporters Without Borders, the journalists were arrested by the intelligence ministry “in order to verify whether or not they work for news media based abroad.” They are currently being held in isolation cells in Evin prison’s Section 209, which the intelligence ministry controls. (New York, January 31, 2013) – Authorities arrested, detained, and harassed some of Iran’s most celebrated rights lawyers, and stepped up their assault on critical journalists, bloggers, and their families in 2012, Human Rights Watch said today in its World Report 2013.The government also prevented reformists and opposition leaders from participating in parliamentary elections, and is holding the opposition leaders Mir Hossein Mousavi, Mehdi Karroubi, and Zahra Rahnavard under house arrestas Iran prepares for its presidential election in June 2013. The judiciary issued death sentences based on non-serious, vague, or ill-defined crimes such asmoharebeh, or enmity against God, and authorities executed several hundred prisoners, many of them alleged drug offenders. Discrimination, both in law and in practice, against Iran’s ethnic and religious minorities led to the arrests of dozens of Baha’is, Christians, and Sufi Muslims. Iran’s government refused to cooperate with United Nations bodies and denied entry to the special rapporteur on human rights in Iran, Ahmed Shaheed, who released two reports providing a “deeply troubling picture of the overall human rights situation” in Iran. Thousands of Iranians, including many journalists and activists, have fled the country since 2009. Authorities have so far not allowed opposition parties and candidates affiliated with the reformist movement to field candidates for the June 14 presidential election. Iran remained one of the world’s foremost executioners, with more than 500 prisoners hanged either in prisons or in public in 2012. Many had been convicted of drug-related offenses, including trafficking and possession, which internationally are not considered sufficiently serious to warrant execution. The UN Office of Drug Control (UNODC) continued financial support for law enforcement projects to combat drug trafficking in Iran although its guidelines require it to freeze or withdraw assistance to countries carrying out executions for drug-related offenses. Iranian authorities have executed dozens of people since January 2010, many of them ethnic minorities, for moharebeh because of their alleged ties to armed or terrorist groups. Currently, more than 20 members of Iran’s Kurdish minority are on death row, sentenced on politically motivated charges. They include Zaniar and Eghbal Moradi, who are at imminent risk of execution. Since May 2011, authorities have executed at least 11 Iranian-Arab men and a 16-year-old boy for alleged links to groups involved in attacking security forces. On January 9, 2013, authorities informed the families offive Arab activists that Iran’s Supreme Court had affirmed their death sentences for moharebeh. In January 2012, the Guardian Council approved the final text of an amended penal code, but the bill has not yet been signed into law. Lawmakers and judiciary officials have repeatedly portrayed the proposed code as a serious step toward compliance with Iran’s international human rights obligations, but it retains the death penalty for child offenders and for crimes not considered serious under international law. As of December, 43 journalists and bloggers were in prison in Iran, according to Reporters Without Borders. On November 6, authorities notified family members of Sattar Beheshti, a blogger, that he had died in custody following his arrest by Iran’s cyberpolice on October 30. In response to international and domestic pressure, and allegations that Beheshti had been tortured, Iran’s judiciary announced on November 11 that it would open an investigation and hold anyone responsible for wrongdoing accountable. A parliamentary committee announced in January that several arrests had been made in connection with Beheshti’s killing, but that his initial arrest was lawful and warranted. The committee said investigations were ongoing. The government systematically blocked websites, slowed internet speeds, and jammed foreign satellite broadcasts. Iranian security forces significantly increased their targeting of family members of Iranian journalists working for foreign media organizations. In September, the government announced that the first phase of a “halal,” or legitimate, internet to protect users from socially and morally corrupt content had been carried out in most provinces. On March 4, Abdolfattah Soltani, a prominent rights lawyer, learned that a revolutionary court had sentenced him to 18 years in prison, barred him from practicing law for 20 years, and ordered that he serve his sentence in Borajan, a city more than 600 kilometers south of Tehran, where he lived. Prosecutors charged Soltani with “propaganda against the state,” assembly and collusion against the state, and establishing the Center for Human Rights Defenders (CHRD), which Soltani co-founded with the Nobel peace laureate Shirin Ebadi. An appeals court reduced Soltani’s sentence to 13 years and reversed the ban on practicing law. On the same day, an appeals court issued a six-year prison sentence against Narges Mohammadi, a CHRD spokesperson, on similar charges. A month later, an appeals court informed Mohammad Ali Dadkhah, a defense lawyer, that it had upheld his nine-year prison sentence on charges related to interviews he had given to foreign media and membership in the CHRD. The court also sentenced Dadkhah to fines and corporal punishment (in the form of lashes) and banned him from teaching for 10 years. 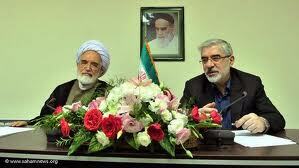 Mohammad Seifzadeh, Houtan Kian and Nasrin Sotoudeh, other defense lawyers, are also in prison. In December Sotoudeh and the filmmaker Jafar Panahi were awarded the Sakharov Prize. The government denied freedom of religion to Baha’is, Sufi Muslims, and evangelical Christians. Security forces particularly targeted Baha’is in the northern city of Semnan. According to the Baha’i International Community, the government has shut down at least 17 Baha’i-owned businesses, and 22 Baha’is have been sentenced to prison terms ranging from 6 months to 6 years since 2009, with 111 Baha’is in prison as of September. The government also targets Sufis, particularly members of the Nematollahi Gonabadi sect. It detained and prosecuted prominent lawyers and adherents affiliated with the group on a range of national security charges. Shaheed said authorities have arbitrarily arrested and detained over 300 Christians, the majority of them evangelicals or Protestants, since June 2010. Socio-Economic and union are the issues of protest in the coming presidential election, said chief of police Ahmadi Moghadam ! University official must control or manage the student uprising ! The motive for street protest is economic issue ! Esmaeil Ahmadi Moghadam chief of Disciplinary Forces of the Islamic regime in Iran: The focus of the enemies are on socio- economic issues and they want to make this as a motive for street protest .In universities the issue of students is Union and the university officials must manage or control the situation. He said: The crime level in Iran decreased from 62% to 35% and the safety/security increased from 35% to 59%. Unrest among the regime officials from now until June 12,2013 the presidential election day. When will the people of Iran start their street protest ? Night time or Day time ? 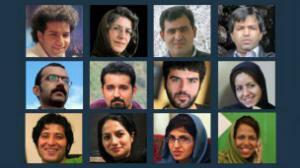 More Journalists Arrested by Security Forces of the Islamic Regime ! According to news coming from Iran, security forces of the regime has arrested two more journalists and they are , Keyvan Mehrgan and Hossein Yaghchi and more journalists were asked to attend at court of revolution in the coming days. These journalists have worked in the past for reformists newspaper . For Keyvan Mehregan this is his fourth arrest since the presidential election coup in June 2009. Islamic regime has started arresting journalist because presidential election is coming ! 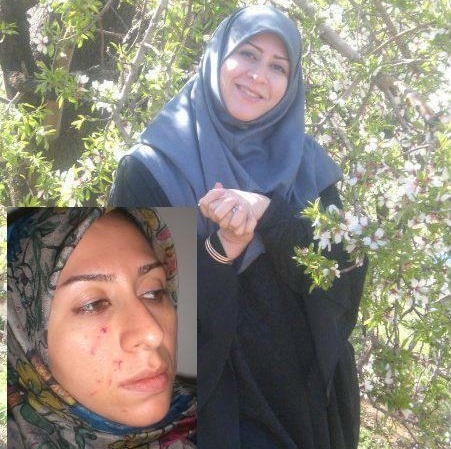 Regime began its repression again before the presidential election on June 12,2013. These journalists are from media such as : Arman ,Etemad, Bahar, Sharq, Aseman, ILNA , and were arrested with the order from judiciary Power. Their charges are "colaboration with Farsi counter revolutionary websites "
According to ISNA news agency ,Minister of Culture and Islamic guidance Seyed Mohammad Hosseini said ,the arrest of journalists isn't media related issue but it is security issue. WASHINGTON, D.C. -- "The trial and conviction of Pastor Abedini represent an outrageous miscarriage of justice and yet one more damning piece of evidence pointing to the rampant denial of religious freedom and the absence of any semblance of rule of law in Iran, " said Katrina Lantos Swett, Chair of the U.S. Commission on International Religious Freedom. Iran’s “hanging judge” Judge Pir-Abassi on Sunday, January 27, sentenced Iranian-born American pastor Saeed Abedini to eight years in prison for “threatening the national security of Iran” because of his activity starting in 2000 in the Christian house church movement. Pastor Abedini has been in Iran since July to establish an orphanage. Pastor Abedini was convicted and sentenced four months after he was arrested in September. “Unfortunately, Pastor Abedini’s case exemplifies the Iranian government’s across the board assault on freedom of religion or belief,” said Lantos Swett. 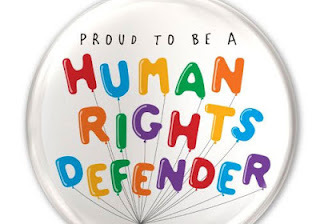 “Iran has intensified its persecution of Christians, including lawyers of these victims, such as Mohammed Ali Dadkhah, a prominent human rights defender who was sentenced to 10 years and who most recently defended Pastor Youcef Nadarkhani and some Baha'i prisoners. The Iranian government also has intensified its attacks against Baha'is, with an increased number of arrests and detentions, including young mothers and their small children." The U.S. Commission on International Religious Freedom has recommended that Iran be designated a “country of particular concern” or CPC for its systematic, ongoing and egregious violations of religious freedom. The State Department has designated Iran as a CPC since 1999. To interview a USCIRF Commissioner, please contact Samantha Schnitzer at (202) 786-0613.
stepped up political surveillance by ordering coffee shop owners to install cameras on their premises and turn over the recordings on demand. Cameras have proliferated in Tehran coffee shops since last summer. "Most people thought they were part of the security systems installed by owners to protect against theft," one Tehrani said. However the cameras are now required to be on during work hours and police have demanded access to the tapes, according to several business owners. The practice became public when Café Prague, one of the most popular coffee houses in Tehran, closed down last week after its owners refused authorities' orders to install a video system. Café Prague, a stone's throw from Tehran University in the heart of the capital, has been a sanctuary for students, activists and young intellectuals since its opening in 2009. A few weeks ago, Tehran's morality police and security authorities told the café's proprietors to install a minimum of four surveillance cameras on the premises as part of state efforts to tighten civic monitoring and security. The owners decided they would not do so. Recognising that this would result in further harassment and eventual closure, they shut down the cafe themselves to protest against the new surveillance measures. "We always knew this day would come and, in the midst of Tehran's grimy winter, our end has finally arrived in spite of our many attempts to stay afloat," read a statement posted on the Café Prague Facebook page. "But as much as it pains us and as much as we will miss our friends and all of you who stood by our side in the past four years, we take comfort in knowing that we at least didn't let Big Brother's glass eyes scan and record our every step, minute and memory from dawn till dusk." 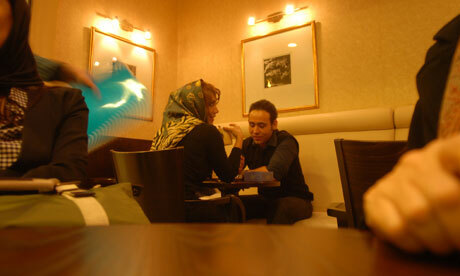 The café's closure is a significant loss for Tehran's academic and cultural life. During its short existence, Café Prague offered much more than just coffee and free wi-fi; it played host to a number of social and political events, from photo exhibitions supporting local artists to music performances and vibrant left-leaning discussions on workers' rights. "I have four years' worth of memories in that café," said Amir Hossein, a photographer. "I am sad that I didn't spend more time there. Café Prague wasn't just a café; it was like home, a safe haven for us to forget all our daily troubles and burden." From the ninth century, the Iranian coffeehouse was a place that poets, artists and dervishes could gather without fear of harassment by royal deputies or local authorities. In the modern era, dissident café culture in Tehran stretches back some 85 years to the time when the celebratedCafé Naderi - much like Café de Flore and Les Deux Magots in Paris - became a magnet for the intellectual elite. For decades it was frequented by prominent literary figures such as Sadegh Hedayat, Jalal al-Ahmad, Simin Daneshvar and Nima Yooshij. After the 1979 revolution, the government closed many coffee shops, declaring them part of the "western cultural onslaught". Harking back to those early days of the Islamic Republic, some conservative political and religious leaders have taken a stricter line against "foreign culture" in recent years, promoting plans to "Islamicise" universities' liberal arts curricula and once again shutter venues that facilitate socialising and the exchange of ideas unbound from customary constraints. Last July, more than 87 cafés and restaurants in a single district of the capital were reportedly raided for defying "Islamic values." The crowds at coffee shops in Iran tend to be young. They are the site of many couples' first dates, a place where they can be free of the inhibitions imposed by the morality police or parental supervision. Groups of young people gather as well, for everything from discussions after class at university to birthday celebrations. "The decision to force this or that place to follow the rules or shut down also signals another trend at Tehran's coffee shops," an observer told Tehran Bureau. "An increasing number of their patrons use coffee shops to discuss politics - something the government does not appreciate." Musavi's Children: We Have Absolutely No News About Our Parents! 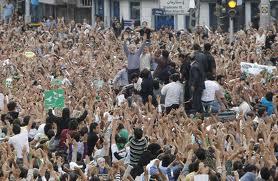 Will The Iranian People Start Their Street Protest for Their Release as they warned regime in the past ! Leaders of Green Movement ( Musavi, Karoubi and Rahnavard )starting their third year imprisonment ( House Arrest ) Under Presence of Many Security Agents ! Musavi's children in a statement have said: They have absolutely no news about their parents, who have been under house arrest for almost two years. The children also are worried about the health of their parents Mr. Mir Hossein Musavi( 10th Presidential Candidate )and Mrs. Zahra Rahnavard at a time when 11th presidential election is going to take place just in five months on June 12,2013. The children added : "Many security agent are present at the house and controlling everything. This is illegal and it looks like kidnapping. They should be immediately and unconditionally released. " (London, January 24, 2013) – Iran’s judiciary should quash death sentences against five members of Iran’s Ahwazi Arab minority and immediately cancel their execution, Amnesty International and Human Rights Watch said today. The sentences were handed down by a revolutionary court and upheld by the country’s Supreme Court on January 9, 2013. Iranian Ahwazi Arab rights groups maintain that authorities extracted “confessions” from the five men while subjecting them to torture or mistreatment and denying them access to a lawyer and their families for the first nine months of their detention at a local Intelligence Ministry facility. The men later denied the charges against them in court, sources reported. IRAN WATCH CANADA: Three days after release (She was released for indefinite according to prison official), But she was called back to prison.!!??? Picture below shows her son Nima says good bye to his mom again. 18 January 2013 – The United Nations human rights office today welcomed the temporary release of lawyer and human rights activist Nasrin Sotoudeh, who is serving a six-year sentence in Iran, and voiced the hope that her leave will be extended and she will soon be released indefinitely. Ms. Sotoudeh, who was arrested in September 2010, was banned from practising law for 10 years on charges linked to her work as a human rights defender. Last October, she began a hunger strike to protest against her prison conditions as well as a travel ban imposed on her husband and 12-year-old daughter. Rupert Colville, spokesperson for the Office of the High Commissioner for Human Rights (OHCHR), told reporters in Geneva that Ms. Sotoudeh was granted a three-day temporary leave from Tehran’s Evin Prison and joined her family yesterday. “The travel restrictions imposed on her family – the issue that caused her to go on hunger strike in the autumn – were lifted in December, so her temporary release marks a second improvement in her case,” he stated. Last month High Commissioner Navi Pillay urged Iran to promptly release Ms. Sotoudeh and all those activists who have been arrested and detained for peacefully promoting the observance of human rights in the country, noting that the rights to freedom of expression and opinion, and peaceful assembly are fundamental human rights which must be protected and respected.